In an age of increasing environmental concern, the UK’s transport network offers a carbon-friendly way to travel, but one also blighted by poor service and high complaint numbers. Fortunately there are organisations committed to getting the voices of the rail users heard and improving the nation’s transport system. 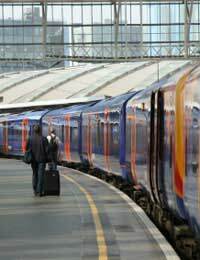 UK train passengers are supported in their quest for fair and high quality rail travel by the independent rail consumer watchdog, Passenger Focus. The organisation has existed in some form since 1947, most recently having taken over the roles of the Rail Passengers Council and the regional Rail Passengers Committees. The mission of Passenger Focus is to get the best deal for the UK’s railway travellers and their key concerns are fares and tickets, quality of service and investments in the railway. Not only do they represent the interests of rail passengers by monitoring the rail network's policies and performance and making make a stand for themselves. Whereas Passenger Focus deals represents rail customer interests outside of London, the independent watchdog organisation London TravelWatch is concerned with transport users in and around the capital. The London Assembly funded organisation is focused on pushing for better standards of quality, performance and accessibility within the services operated or licensed by Transport for London, such as the London Underground, buses, river ferries, Docklands Light Railway and the national rail services. If a complaint with a transport operator fails to achieve a satisfactory resolution, or is not dealt with within a reasonable time period, then Passenger Focus and London TravelWatch are able to take up the issue with the responsible parties. An independent review will be carried out to assess whether the complaint was dealt fairly by the train operator. If the conclusion is that more should have been done then the appropriate consumer watchdog will make a representation to the transport operator on the complainant’s behalf. For an efficient complaint review consumers should be clear about why they are dissatisfied with the operator’s response and be able to provide all appropriate correspondence. Beyond Passenger Focus and London TravelWatch, there are a variety of organisations across the UK representing consumers that are unsatisfied by the way their complaint has been dealt with by the service provider. In England and Wales, any longstanding complaint regarding a bus service, regardless of whether it’s private or subsidised, can be referred to the Bus Appeals Body or the Passenger Transport Executive for the area. In Scotland public transport complaints can be taken to the Public Transport Users’ Committee (PTUC). A local Citizens Advice Bureau will also be able to offer guidance on where to further their complaint about a transport service provider. Passenger Focus and London TravelWatch are unable to get involved with complaints until the transport operator responsible have first had a chance to sort out the matter themself. If a complaint arises regarding any UK transport system then the service provider should be the first port of call. Most transport complaints can be resolved immediately by contacting the company responsible directly. Most private operators maintain charters or codes of practice that outline how complaints are handled and what a customer can expect if they raise an issue. In London complaints can be taken directly to Transport for London (TFL), the official representative of transport in the capital. Passenger Focus are able to offer advice on the best way of submitting a complaint and are always interested in hearing about problems with the rail network, as it is valuable research information that could help shape future campaigns. I BOUGHT FOUR CONTINENTAL CAR TYRES FROM KWIK-FIT AND WAS CHARGED ABOUT POUNDS 90.00 PER TYRE. I LATER SAW THEIR WEB SITE AND WAS SURPRISED TO FIND THAT THEY WERE SELLING THE SAME PRODUCT ON LINE FOR POUNDS 68.00. I COMPLAINED TO THEM BUT VERY SORRY AND DISAPPOINTED TO BE ADVISED THAT THEIR PRICING ON LINE AND IN THE STORE ARE DIFFERENT AND THE MANAGERS ARE NOT AWARE OF THE ON LINE PRICE. I WAS THEREFORE REFUSED ANY REFUND OR COMPENSATION. I NEED TO KNOW WHETHER THEY ARE CORRECT AND THAT I HAVE NO CHOICE BUT TO ACCEPT THEIR HIGHLY INFLATED PRICE. Hi, I bought a galaxy s7 edge from a local second hand shop. I found some issues with the phone that night and returned the phone for refund next morning. However the shop refused to refund, he said I tested the phone and it is in good working condition. He then said if you want a refund then you will have to wait until I sell this phone also he mentioned one or 2 days this will be sold. Its been 5 working days, he has not contacted me and when I texted him he didnot reply me. Is there anyway I can make a complaint against him and his shop to get my money back quickly? I believe IRCAS have not followed the SRA Policy for Penalty Fares in deciding an appeal to a penalty fare. Is there an appeal process to the decision by IRCAS?